Here’s Why You Should Choose This Woking Clock House Log Cabin. This superb ‘Woking’ garden log cabin with its very special design oozes charm. It should not take much to imagine how great this will look in your garden and also how many uses it will give you and your family. Your children will love you (even more) and when your friends and family come round it can be the centrepiece of your social gathering – maybe with a barbecue and a few drinks. The style of this log cabin is obvious and the thought which has gone into this building is hidden away – as all good design should be. Good design should not really be noticed. Being made with the renown Nordic timber the quality and strength, which comes a standard, evolves from the slow growth of these trees. Extensively used in Sweden who tend to know a little about log cabins and the type of wood to use. This stylish cabin will fit into most garden and its looks can fit in with any style of home. Besides the standard windows, there is an option for extra windows to suit you if you prefer. Remember the choice should be yours and that’s how it should be. This ‘Woking’ Log cabins are constructed from solid timber. You won’t find any chipboard, OSB board or other nasty and cheap materials in these log cabins. Log cabin companies which do only do this to save money but it’s important that the building should last. 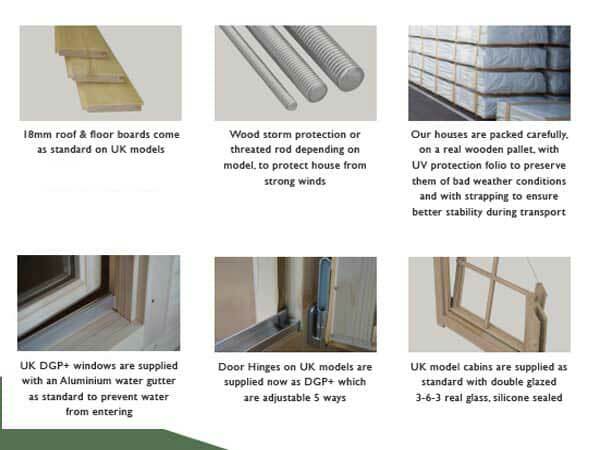 All the doors and windows are double glazed as standard, the quality of the joinery is first rate – as it should be. There are easy adjust hinges supplied as standard to enable that perfect look. The timber naturally comes from renewable sources and is correctly kiln dried for its environment. Designed to be easy to assemble and this commences with the pre-assembly of them before being shipped to you. They are then packaged up – flat pack style – and shipped to you. However, all parts of these log cabins are bar coded for ease of assembly. All this initial work means it easy to build. But if you would like someone to build your new log cabin for you then we can help. An optional log cabin assembly service through a third party ensures you don’t have any worries with maybe the exception of how to enjoy your new log cabin. How good is that? The power of the ‘Web’ is amazing and the ease in finding log cabins is ‘child’s play’. The question is how do you know what you are buying? Well, there is only one way and that is the old fashioned way and view examples of the log cabins ‘in the flesh’. Whereas most log cabins UK companies on the web don’t have any option for viewing we have a log cabin display site for this purpose. This will enable you to see examples of these superb log cabins. By taking a drive out and walking inside these log cabins you will be able to visualise how it would sit in your garden, how it would meet your needs in your life. By being ‘touchy-feely’ with the log cabin you can be sure it will meet your needs. Our background in garden buildings manufacturing started in 1979. Being a family business is important to use and also helps to give us the know-how about the quality of materials which should be used. Our Ethos is ‘Make to a Standard – NOT down to a price’. 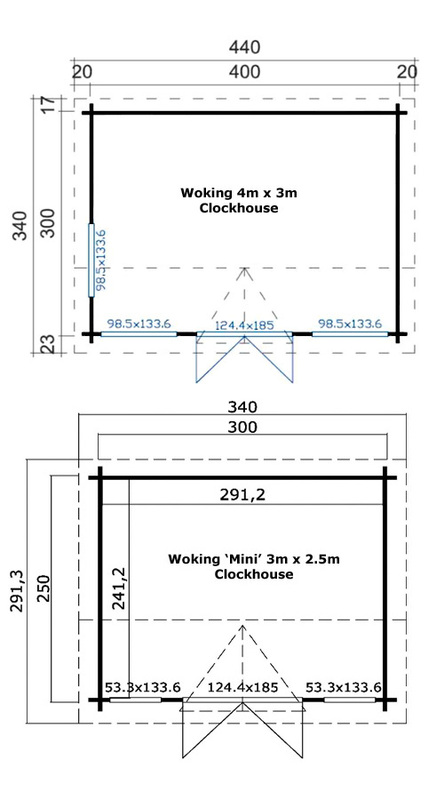 Size: 4m x 3m (13¼ft x 10ft nominal) Clock House Apex or Gable Style. Note this is the external size of the body of the cabin. The lugs extend 100mm on each corner making the overall size (as most other companies quote) 200m larger. We mention this so you know you are comparing ‘eggs with eggs’. Approximate clear internal size will be approx 3.9m x 2.9m. Please check with us if internal size is crucial. Cladding: Choice of 44mm or 34mm thick logs which interlock into each other. 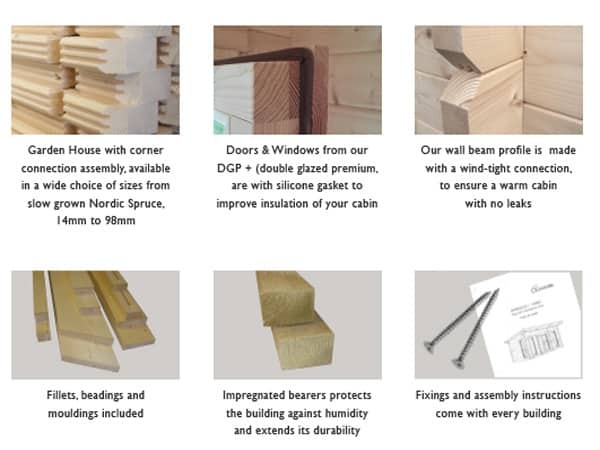 These are cut from a top grade of Nordic Timber to ensure the maximum stability and longevity of the timber. The log profile has designed wind-tight connections to ensure a superior resistance against wind. Untreated. Timber from sustainable sources and is kiln dried. Doors: Joinery quality double glazed double doors 1244mm wide x 1850mm high (49in x 72½in) – approx sizes. Glazed with toughened glass as standard Easy adjust hinges complete with gasket seals, fitted silver finish door handles, cylinder lock and two unique keys. Low doors sills giving you easier access into your log cabin. Supplied untreated. Georgian bars include as standard so you can have Georgian or plain style appearance. Beware of doors with single glazing or excessively high door sills..
Windows: Three (3) DOUBLE Joinery quality inward opening windows included as standard. Size of each window is 985mm wide x 1336cm high (38i½n x 52½in).Complete with easy adjust hinges, silicon gasket seals and delightful silver finish window handles. Supplied untreated as standard. Double glazed as standard NOT single glazed. Georgian Boards for windows are included FREE of charge. Roofs: 18mm thick T&G boards used on the roof sections supported by strong roof beams. Roof beams meet EN 388 stringent standards. Untreated. Supplied with felt tiles (shingles) in either red, brown or green or Polyester based felt as standard. 200mm (approx 8in) overhang all round. Clock House feature adds to the overall look of this cabin. Roof Overhang: A delightful roof overhang around this log cabin enhances its style. This makes the overall roof size 4.4m x 3.4m in size. Floors: 18mm thick T&G untreated boards used on these log cabin floors. No chipboard, OSB or other cheap sheet materials used on the floor, unlike some other log cabin suppliers. Floor joists are 70x45mm or 45x45mm and are normally space no more than 650mm apart. All floor joists are pressure treated for long life as standard. 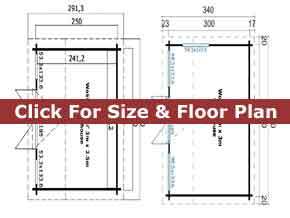 Lower Walls: Height: 2100mm (82½in) – on all Woking log cabins for sale. The summer was invented for this Woking log cabin with its attractive ‘clock house’ feature and pavilion style. The deep glass in the windows and doors allowing light to floor inside making it a superb place to relax in throughout the year. These Nordic wood cabins are fully double glazed for comfort and under 2.5m tall for planning.